TAMURA, FUKUSHIMA PREF. - Residents of Tamura, Fukushima Prefecture, were allowed to visit their homes in the nuclear no-go zone for two hours Sunday. Tamura was the third of nine municipalities in the radioactive danger zone allowed to carry out the visits since an exclusion zone with a 20-km radius was set up around the crippled Fukushima No. 1 power plant on April 22. According to Tamura officials, 130 people from 76 households in the western part of the city decided the visit was worth the risk to their health. The residents, who ranged in age between 16 and 83, were only allowed to bring back items that could fit in a 70 cm by 70 cm plastic bag. “We really need our “hanko” (personal seal), bank book and driver’s license,” Tadako Munakata, 78, told The Japan Times. Among other items on her handwritten must-get list were half-sleeve shirts for the summer and her husband’s shaver. “That’s all I am planning to bring back, its not much,” she said. Munakata said she and her husband are living with their son in Edogawa Ward, Tokyo, for the time being and made the trip to Fukushima on Saturday just for this chance to visit. But she appeared alarmed at the thought of entering the danger zone. 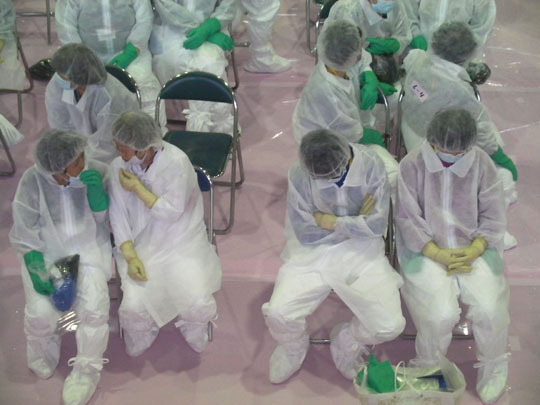 Displaced by the nuclear plant crisis that was triggered on March 11, the residents gathered at a local gymnasium where they were handed protective suits, masks, hats and their own radiation detectors. After suiting up, they were separated into eight groups and loaded onto eight city-rented buses. Teijiro Yoshida, who lived in the Kotakisawa district, said he wasn’t very worried about what to bring back. He was more concerned about what he could leave. “I am taking about a dozen cans of cat food and leaving it there,” said Yoshida, who left his pet cat in the no-go zone. The residents were also allowed to submit requests to have their dogs or cats rescued from the zone, but not to bring them back themselves. “We don’t know if our cat will still be there, but it’s the least we can do,” Yoshida, 83, said. According to city officials, the highest radiation in the area being visited Sunday was 1.3 microsieverts per hour. Scientists agree that exposure to more than 100 millisieverts increases one’s cancer risk, but they are unsure about whether levels less than that pose a risk. Mayor Yukei Tomitsuka has requested that the central government consider easing restrictions in Tamura since there are areas with higher radiation levels outside the 30 km danger zone. “There is no reason for us to be wearing the protective suits. This is exaggerated,” one resident said. Tomitsuka agreed, saying he strongly urged the central government to look at its own radiation surveys more closely, adding that it was a shame the visits were taking place so long after the disasters hit. After visiting their homes, the residents were to come back to the gymnasium and undergo radiation checkups. Just in case, the floor and walls of the gym were covered completely with plastic sheeting to prevent contamination from radioactive materials. The Self-Defense Forces also set up a decontamination tent within the gymnasium in case high levels of radiation were found among those returning. Also dispatched to the gym were an Radiation Emergency Medical Assistance Team from the National Institute of Radiological Sciences as well as staff from Tokyo Electric Power Co., local police, fire departments and other government ministries. In addition, an ambulance, six backup vehicles and a helicopter followed the buses to the residents’ homes. Caution also prevailed after the trips concluded. Not only were the residents given radiation checks, but their bags and belongings were also scanned with Geiger counters. In the end, there were no mishaps Sunday and the residents’ radiation readings were “at a level that needed no concern,” one government official said. Kazuo Endo, 62, said he spent the two hours at home taking care of overgrown weeds. Although his Geiger counter did not beep during the trip, it did appear to be going up, he said. Among the personal belongings retrieved was some paperwork for his father’s funeral, which took place in April 2010, Endo said. The papers were necessary to prepare for a proper one-year anniversary ceremony, he said. The preparations for the occasion were on his mind even as he was evacuating to the nearby city of Funehiki to live with daughter, he said. “I don’t understand much of the technological terms regarding the nuclear power plant . . . but I just hope this situation will be over soon,” he said. The health ministry plans to launch a 10-year followup survey on the physical and mental health of 30,000 people in the Tohoku region to gauge the impact of the March 11 earthquake and tsunami, ministry officials said Saturday. 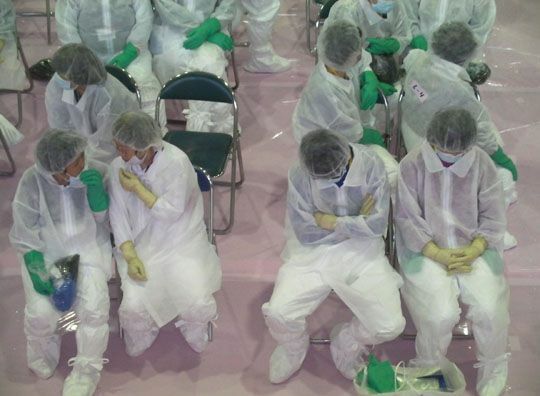 It will select 10,000 people each in Iwate, Miyagi and Fukushima prefectures to check the various physical and mental effects caused by their direct experience of the disaster, their prolonged stays in the shelters, and how their conditions change over the coming years. Professional care will be arranged for those found in need, the officials said. 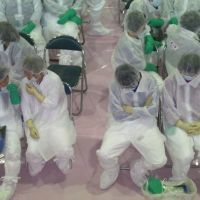 In June, the Health, Labor and Welfare Ministry is expected to set up a team of doctors, nurses and other experts from medical facilities in the prefectures as well as national hospitals. The ministry believes the results of the survey will be useful in drawing up medium- and long-term relief and welfare measures as well as health care services for future disasters, they said. “The population of the affected areas was already aging (before the disaster) and there were many people living without relatives,” said Ichiro Tsuji, a professor at Tohoku University.